Standing on top of the mountain… | Rosi G.
Mods: Well, this pattern is one big mod. You can read my three previous posts, if you haven’t done so already. The instructions are more like a recipe, as are most of Elizabeth Zimmerman’s patterns. The eco wool makes this sweater more like a jacket and I’ve been wearing it as such for the past week. The times that it was a bit windier, I threw a denim jacket over it. I made it with 6″ of positive ease (it stretches a lot!) so that I could possibly wear a sweater under it if I don’t want to wear a coat on any given day. In my excitement of finishing it last Sunday, I wore it to work on Monday with safety-pin stitch markers where the buttons needed to be sewn in. I went at lunch and bought the buttons and sewed them at work! HA! I’m going to give the sweater a REALLY good blocking but I hope it doesn’t grow too much!! Because, no, I haven’t blocked it. I’ve been wearing it EVERY DAY! 😉 The steeking, of course, made me super nervous. But it’s like anything else in knitting that you have to learn: afraid to jump in but then you do and you feel accomplished! Although, I do admit that each time I wear it, I look at the inside to make sure it’s not falling apart somewhere! HA! It’s not, though. I actually think the cut edges are felting themselves to the inside!!! 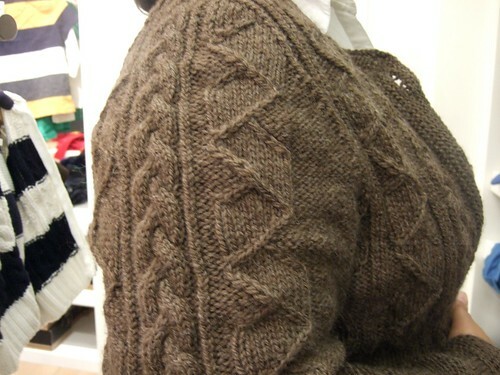 All in all, a tremendously satisfying knit. Previous PostHow well do you know your friend?Next PostIt’s puzzle time! congrats. that turned out so well. yes it is indeed a recipe or a draft more than anything else. but i loved knitting it too. especially my second one where i remembered to mirror the sheepfold and such. 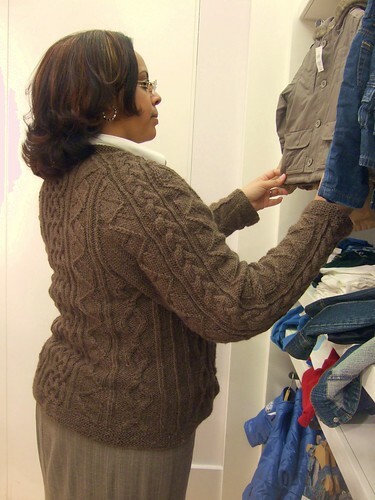 I wandered over from the Zimmermania blog to tell you that that sweater looks gorgeous!!!! I would have done the same thing about the buttons hehehe. Oh, it’s marvelous, absolutely fantastic! Beautiful sweater! You did an amazing job. Perfection. 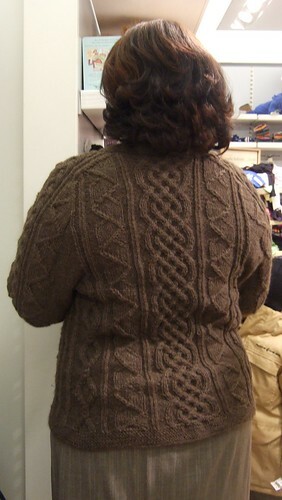 I am so impressed – what a wonderful sweater! Also, very impressed on how quickly you were able to finish it up. If (god forbid) it blocks up much bigger, you can always try some GENTLE felting… The eco wool I am sure would oblige, and it would make it even more suitable as a jacket. Again, it’s bootifuL! I really love the colors in the buttons. Wow, talk about go tell it from the mountain! I’d be stopping people on the street telling them “Yes, I made this”. Great job, once again. That sweater is amazing. The speed in which you made it is even more amazing. Congratulations! Beautiful! The sweater looks amazing. What a beautiful sweater! And your sweaters always fit you pefectly! Absolutely Gorgeous!! I luv cables!! Luv the buttons, too!! Absolutely gorgeous! You are an inspiration to all of us! It’s a sweater worthy of a mountaintop. So beautiful. Don’t know as I’d block it, just keep wearing it, and let the wool naturally block to my body. All I know for sure is that EZ is smiling with joy at a recipe happily, cozily completed. 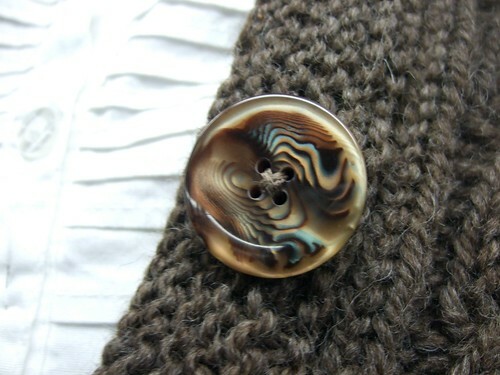 Coming over from Zimmermaniacs… What a beautiful sweater…and absolutely perfect buttons! Congratulations on a beautiful knit. Fabulous! I saw this on Zimmerman’s blog and thought I’d see what else you’ve been up to…..You’ve done an incredible job. Gorgeous! Where did you get ecowool for $12/skein in NYC? Fellow New Yorkers want to know. And I’ll have to check out Vardhman for buttons. I LOVE it–you did a beautiful job. Congratulations! Gurl it is just marvelous!! ALL OF IT! Brava! Abosolutely beautiful! Thankyou for sharing such an inspiring garment. This is just gorgeous!! I am amazed! I think it’s so lovely on you! it�s marvelous, marvelous, I love cables.It fits perfect. You go girl. Beautifully done! And what a bargain– now I definitely want to get some Cascade Eco Wool and be a copycat! wow!!!!! wow!! wow……………………you totally amze me girl!!!! fabulous job! KNIT ON!!!! That is one fine looking sweater! Great job! It looks beautiful and a great fit.